Donna Tartt has conjured up some critical controversy with her latest novel, The Goldfinch. While it has been awarded the Pulitzer Prize for Fiction 2014, the critics have been fighting over whether or not this book should be getting the accolades that is has. Read more about it in Vanity Fair. But, controversy or not, it is a fascinating, enthralling story about Theo Decker. 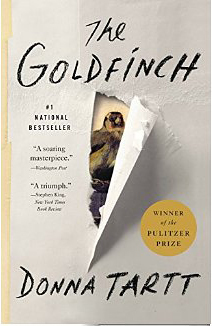 Theo’s troubles begin when, while visiting the Metropolitan Museum of Art with his mother, the museum is blown up by terrorists, killing his mother, while he barely escapes with his life, and with one of the most valuable paintings in the world, the Carel Fabritius masterpiece, The Goldfinch. His life takes on many twists and turns as he struggles to keep the painting hidden and ultimately find meaning for his own life.